Clear tiles by making sums. Math-tastic.Click on adgacent numbers to create sums. 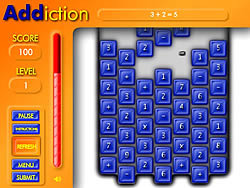 Double click on the answer to clear tiles from the board. Score points to keep the timer alive.